The Bank of Japan has walked furthest along the path of non-conventional policies. The central bank introduced quantitative easing as early as 2001 for the purpose of expanding its monetary base. After a first attempt of exiting non-conventional policies, the Bank had to revert to broader and larger asset purchases in the “Comprehensive Monetary Easing” from 2010. In 2013 it took a big step up through its “Quantitative and Qualitative Monetary Easing”, a massive expansion of the monetary base and compression of risk premia, mainly through purchases of government securities and maturity extension. The program has picked up pace since then and is being supported by novel features, such as “yield curve control” and “inflation overshooting commitment”. Japan’s financial crisis in the late-1990s impaired the liquidity and capital of its banking system. Financial support faced strong public resistance and it took a considerable amount of time before public funds were actually injected into financial institutions. As a result, the economy suffered a large-scale credit crunch and ultimately fell into a deflationary trap. In order to alleviate liquidity concerns the Bank of Japan first introduced zero interest rate policy (ZIRP) in 1999 and then launched quantitative easing (QE) in March 2001. Under its first QE program, the Bank used purchases of Japanese Government Bonds (JGBs) as the main instrument to reach their operating target of current account balances. Those are reserves held by financial institutions at the central bank. Since the goal of this first quantitative easing was simply the expansion of the monetary base, the Bank of Japan limited its purchases to short-dated assets, which it could simply let expire once conditions for economic growth and reflation had been met. The flipside was that, unlike in later quantitative easing policies, the central bank did not much change the private sector’s balance sheet. Effectively, the private sector swapped one short-maturity risk free assets for another. Ultimately, these operations had little impact on overall financial conditions. The Bank of Japan exited this first phase of quantitative easing in March 2006, amid signs that the economy was emerging from deflation. However, following the global financial crisis, the Bank of Japan increased the pace of its JGB purchases and adopted a number of additional unconventional measures to promote financial stability. In October 2010, the Bank of Japan introduced its Comprehensive Monetary Easing (CME) policy to respond to the return of deflation and a slowing recovery. The policy rate was lowered to around 0–0.1 percent, which amounted to adopting the so-called virtually zero interest rate policy. The main element of CME was to generate downward pressure on longer-term interest rates by purchasing JGBs (and Treasury discount bills). In addition to the impact on the funding cost, the JGB purchases were expected to generate downward pressure on the risk premia and to create a positive wealth effect. In order to enhance these effects the Bank of Japan also purchased risk assets such as commercial paper, corporate bonds, exchange-traded funds, and real estate investment trusts. Also, this round of quantitative easing failed to raise inflation expectations decisively. The “deflationary mindset” prevailed, reflecting that CPI inflation had remained around zero or slightly negative for more than a decade. As Bank of Japan board member Takehiro Sato recognized: “Once long-term inflation expectations…are de-anchored, a central bank’s ability to influence inflation is constrained significantly due to the zero interest rate bound”. The landslide election victory of Shinzo Abe in 2012 provided the Bank of Japan with a stronger political mandate to overcome deflation. The central bank would play a key role in the so called “three arrows of Abenomics”, a three-pronged strategy that comprises aggressive monetary easing, flexible fiscal policy, and supply side reforms to spur private investments. The first key decisions under the augmented mandate were the introduction of a 2% inflation target and the initiation of a new open-ended Asset Purchase Program, initially scaled to an estimated 7% of GDP (view post here). 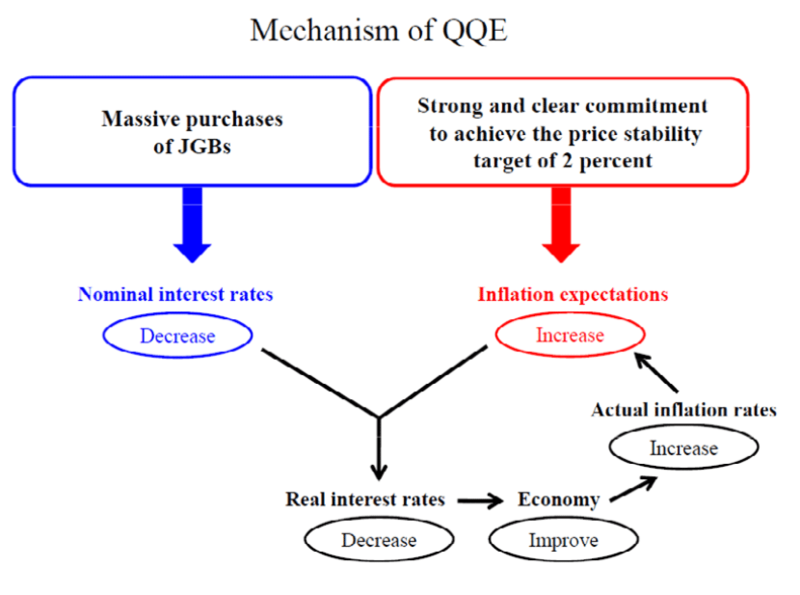 In April 2013 the new Bank of Japan Governor Governor Haruhiko Kuroda unveiled a step-up in size and commitment to monetary stimulus, in form of the Quantitative and Qualitative Monetary Easing (QQE, view post here). The new policy relied on two pillars. There first was a public commitment to reach the 2% price stability target within roughly two years and maintain it. The second pillar was the pursuit of a new operating target: the massive expansion of the monetary base through purchases of government securities, including bonds with long maturities. Specifically, the monetary base was initially targeted to increase at an annual pace of about 60–70 trillion yen [10-12% of GDP] to reach a total of 60% of GDP, far above levels in other advanced economies. In October 2014 the pace was elevated to 80 trillion yen. At the same time the Bank decided to raise the annual pace of JGB purchases from about 50 trillion yen to 80 trillion and to extend the average remaining maturity from about 7 years to a flexible range of 7-10 years. With the introduction of yield curve control (see below) that pace was scaled back to 40-50 trillion yen. As a consequence of these operations the Bank of Japan’s holdings of Japan Government Bonds (JGBs) have soared from a market share of 12% at the end of 2012 to an estimated 41% at the end of 2016. The average remaining maturity of the Bank of Japan’s JGB purchases has been extended as well. The Bank of Japan is also purchasing equity exchange traded funds (ETFs) and Japan real estate investment trusts (J-REITs). Quantitative and Qualitative Monetary easing is being implemented with forward guidance. The Bank informs the public of its intention to expand the monetary base, and by implication JGB purchases, in the future and, moreover, stands ready to adjust the pace of expansion is that appears necessary for securing the 2% inflation target. Thereby, the Bank of Japan means to secure low or negative real interest rates and set in motion a self-reinforcing dynamics of rising inflation expectations, an improving output gap, and broad actual increases in prices and wages (view post here). By 2016 QQE had succeeded in lowering real interest rates through both lower nominal rates and increased inflation expectations. Broad price trends had recovered from outright deflation. However, the 2% inflation target remained out of reach and doubts about the sustainability and ultimate success of the program remained. In January 2016 the Bank introduced negative interest rate policy (“NIRP”) by applying a negative interest rate to marginal increases of current account balances held by financial institutions. This policy not only led to a decline in shorter-maturity interest rates below zero, but also increased financial institutions’ preferences for holding JGBs, even with super-long-term maturities. It thereby cause a lowering and flattening of the yield curve. Negative yields and flat curves, however, raised fears about the profitability and long-term functioning of the financial system. Concerns focused on the profitability of banks, insurance companies and pension funds, as well as on the increase in corporate pension obligations. As a consequence of these concerns the Bank of Japan introduced in September 2016 QQE with yield curve control (view post here). 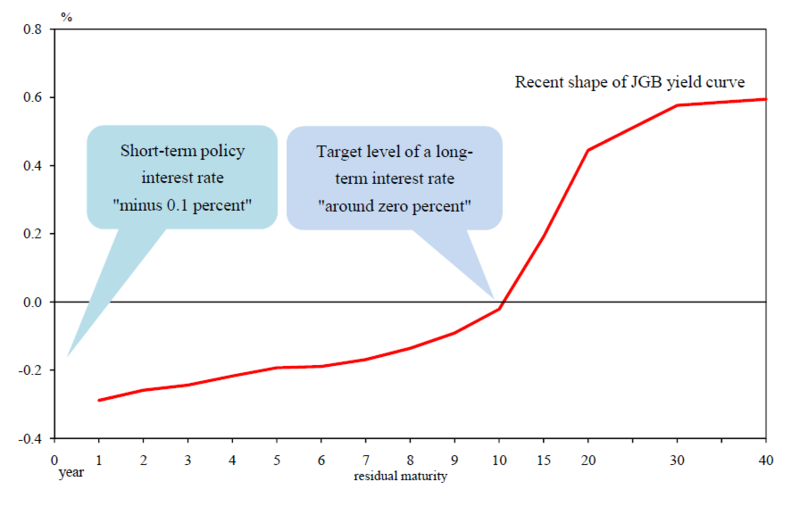 The new policy would target not just short-term rates but also long-term JGB yields under the guideline for market operations decided at every Monetary Policy Meeting. In practice this should allow targeting a positive yield curve against the backdrop of negative short-term rates and negative expected long-term real rates, thereby mitigating the debilitating effect of yield compression on the financial system. The QQE with yield curve control was combined with a new inflation overshooting commitment. The Bank committed itself to expand the monetary base until the observed annual rate of inflation would exceed the 2% target and stay above that level “in a stable manner”. This would mark an augmented “history dependent” inflation commitment. Along with some degree of control over long-term yields this put the Bank of Japan in a better position to accommodate rising demand and inflation, even if monetary policy alone might not create these dynamics. Deflation is deeply entrenched in Japan. Moreover, structural and demographic factors probably increase the countries propensity to deflation. Hence, the monetary easing must be implemented with a force that may ultimately be difficult to control. However, because of Japan’s record public debt stock and without significant fiscal consolidation this could pose questions to sovereign financial stability. Even if the Bank of Japan did keep real and nominal interest rates low after the country returned to inflation, the old “deflationary equilibrium” would be broken. Excess savings and the external surplus are likely to turn into deficits, ultimately eroding the domestic funding of government debt and driving up sovereign default and inflation risks premiums. Moreover, the decade-long low level and volatility of government bond yields led financial institution to take massive notional amounts of interest rate risk. If the deflation deadlock is ever broken and yields are rising several 100 basis points, the resulting mark-to-market losses of bond and swap portfolios could lead to systemic pressure. In particular, the capital adequacy of the banking system could be put in question (view post here). 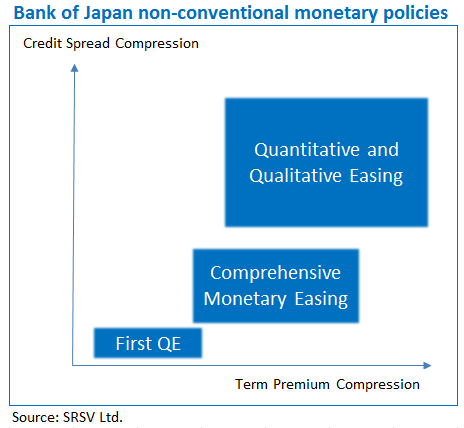 Therefore, the Bank of Japan appears to put particular emphasis on controlling long-term government bond yields in the context of its Quantitative and Qualitative Easing (view post here). Moreover, the rapidly growing share of JGBs held by the Bank of Japan, which has far exceeded the share of government bond holdings of other developed market central banks, poses a risk of bond scarcity. There is evidence that rising bond purchases undermine market liquidity, particularly when central bank holdings exceed critical thresholds (view post here). The consequences of declining liquidity could be systemic. JGBs are essential for local funding transactions and lower liquidity means higher price volatility. This means the market will probably become less resilient against negative shocks.